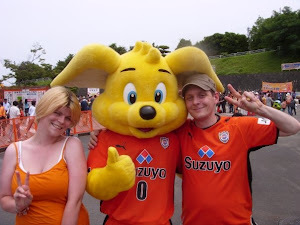 Just when we threaten to put a run together capable of closing the gap on Kashima we go and let three points slip through our fingers in the most infuriating of circumstances. Yeah, I'd have probably taken this result before the game, but going into three minutes of stoppage time 1-0 up we conspired to give away countless free kicks and hand a share of the spoils on a plate to the home team. The string of free kicks awarded by the ref ultimately culminated in a foul perfectly positioned for an excellent cross to be swung on to the head of Ito. He put it home and Iwashita's opener was cancelled out. Kawasaki had been all over us for the final ten minutes, hitting the post once and making Kaito work his hardest as they swarmed all over our half of the pitch, so the goal wasn't a great surprise. Kawasaki have to next face Kashima, Urawa and G. Osaka in three games which will pretty much make or break their season. 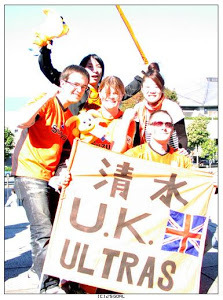 As for us, we have the (on paper) less daunting prospect of Omiya, Yamagata and Kobe. All winnable, and if we hope to make an ACL spot, then we pretty much have to take maximum points from them. Before all that, it's FC Tokyo in the semi final of the cup. Home on Wednesday, away on Sunday. Not only is he clearly onside, he's in his own half! In this video you can see Kenta's reaction who is right behind the linesman and had the same view of it. I'm not sure I subscribe to the crooked official theory, but both this and the free kick appear to be very poor decisions by the linesman and the ref. Very bad officiating by rookie referee Masaki Nabeshima, and these mistakes changed the outcome of the game. Permission to feel hard-done-by? 3-0? Pah, that's nothing. 5-1 on the day, that's 5-4 in aggregate. 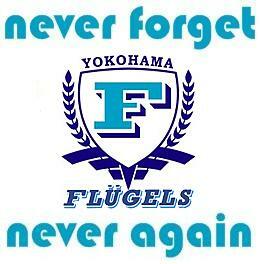 There's only one team in Shizuoka, and today underlined that fact not once, not twice, but five times. 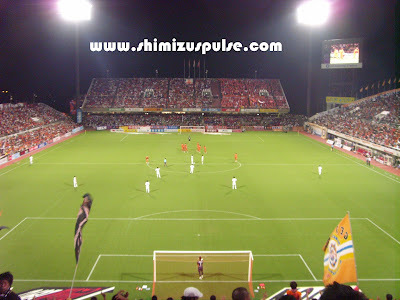 Nihondaira was heaving for another sell out; the biggest game of the season bar none. After the horror of getting beaten 3-0 back in April, we had it all to prove, and we didn't need long to get things going. We burst out the traps and were two up within ten minutes. The first was from Iwashita, and as you can probably guess it was from a corner. Edamura doubled the lead eight minutes later, and suddenly my pre-match prediction of 10-0 wasn't looking entirely improbable. Maeda very nearly pulled one back for Iwata when he smashed a volley against the bar, but less than ten minutes after that we were celebrating again. Our third came from some uncharacteristically elegant play from Hyodo, as he brought a high ball down and evaded the defender on the turn to score a stunning goal. 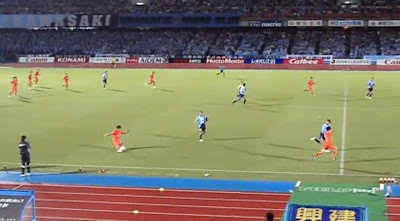 It sent the packed stadium wild, and Jubilo must have known there was no coming back. Maeda did manage to pull one back in first half stoppage time, and the goal puts him level with Okazaki and Kawasaki's Juninho at the top of the top scorers table, all with 12. With that goal on the board, the visitors came out the stronger in the second half, but it was Edamura again who was there to bring down a loose ball and slam it home to make it four just before the hour. 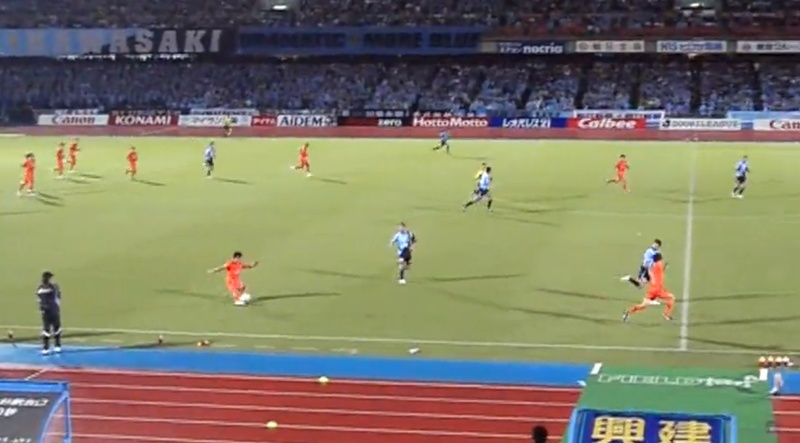 The party in the stands well and truly began when Okazaki beautifully sent it through Kawaguchi's legs to make it 5. Even Kenta joined Loco Loco - he later said once was enough! We're now unbeaten in eight, winning five of those. As is our tradition to start poorly and warm up with the summer, we're up to third. This is before the Sunday games for Gamba Osaka and Kawasaki Frontale, but regardless of their results, we're looking well placed for an ACL challenge. Antlers are still eight points clear of second place, and still look pretty much uncatchable at the top. That said, Urawa were seven points clear with, what? four games left in 2007, and they managed to blow it. We still have eleven games remaining, so who knows! Our game with Kawasaki next Sunday will be a huge chance to set out our intentions, so I may just have to head up to the Todoroki. Post match Loco Loco - including Kenta! We're all getting excited about the Shizuoka prefecture face-off next week. We're also looking forward to the orange head to head with Niigata this Sunday (for which there are only 1551 tickets left.) It looks like S-Pulse have got some great events lined up for supporters to enjoy each match day, so all credit to them. Both games are looking like sell outs, which is excellent work from all concerned. You know something is up when you're woken to find your furniture dancing around the apartment by itself. This morning just after 5am a big earthquake hit Shizuoka City and prefecture causing a lot damage, most minor but some major. A growing number of injuries are being reported but thankfully no deaths. We here at UK Ultras Towers are all fine, but shaken, and hoping the aftershocks stop sooner rather than later. Click here for full details. Time for a news round up! Our twenty year old Korean Kim Dong-Sub was loaned out this week to J2 outfit Tokushima Vortis. Striker Dong-Sub has represented South Korea at national level at U15, U18 and U20 but is yet to make any first team appearances for us. With Hara, Okazaki, Nagai and Johnsen all ahead of him, the club have chosen to loan him out where he will hopefully gain some match experience. The Shikoku side currently sit in 8th in the 18 team J2. He's due to return to the bright orange fold at the start of the new year. Read the full press release here (Japanese). Our reserves sides played two practice matches last weekend. Nagai played most of the second half. :) Read full details here (Japanese). Read full details here (Japanese). As of 5pm Monday evening, less than 3000 tickets remain for this Sunday's clash with Albirex Niigata. With a week still to go, we've already sold more than the same fixture attracted last year, and remain on course to maintain an average crowd way up on last season. For full details of remaining tickets, click here (Japanese). If you want to go, don't wait around - get your ticket asap. Speaking of which, the Derby is mere days away, and as previously mentioned this game will sell out, so don't delay! An excellent result away in Saitama, and the second time we'd beaten Urawa in the space of five days. 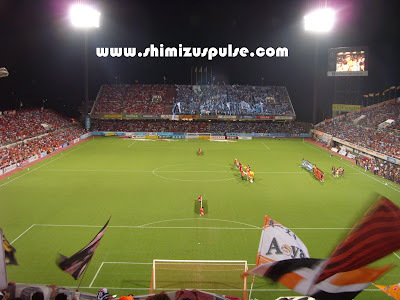 Kingdom Shimizu!! Our goal came from Edamura on 70 minutes, and we had a number of golden chances both before and after to create a bit more of a cushion, but as it was we went into the four minutes of stoppage time hanging on for grim life. Urawa could, and should, have scored at least once, but a lack of real teeth up front cost them, and as their fans concentrated on booing Okazaki, their side slumped to it's fourth defeat in a row. Things were looking more and more panicy as the stoppage time minutes ticked by, but hang on we did! Together with the defeat of Gamba Osaka, this caps an excellent four weeks. Apart from the hellish stoppage time equaliser we conceeded to Kyoto, it's been a top month. We were unlucky not to beat Kashima, but we've picked up away points at Chiba, Osaka and now Urawa. Not to mention to progressing to the semi finals of the cup! Life it never dull on the S-Pulse side of life, and now we have a well earned weekend off while the J. League v K. League All Star game takes place. I'm not especially sad to report no S-Pulse players are involved. The lads all deserve a weekend to themselves. Next we face high flyers Albirex Niigata who will be a stern test. Niigata have both conceed the second least and lost the second least in J1 (both behind Kashima, rather predictably), so will be a very tough opponent. Unbeaten at home for well over a year, I'm confident we can turn them over, and in the process do the double over them - of only three defeats this year for Albirex, one was at home against us. Official match pictures can be found here （top row). 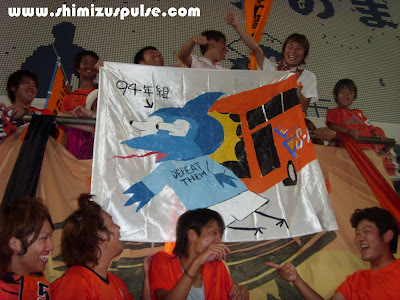 And finally, from down Oita way, the greatest escape from J1 this season so far! Wow. Just wow! 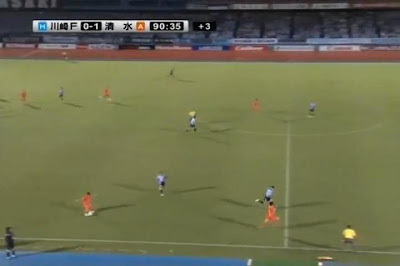 Ex-Pulser Fernandinho set up the equaliser, but surely Oita have left it too late to save their J1 skins?